Imagine for just a moment that you are standing in front of a large audience. They fill the room completely and you can even see people standing way at the back up against the wall. However, something is different about this speech. You have no microphone, no PowerPoint slides, it’s just you up there on the stage. How do you feel about this speech now? Although it sure does seem like it was a long time ago when, once upon a time, microphones did not exist. Now when we’re giving a speech to a room with 20 people in it, we don’t need a microphone in order to ensure that everyone can hear what we are saying and understand the importance of public speaking. However, if you boost that number to 200, 500, or even 1,000 people, then things tend to get a bit more complex. 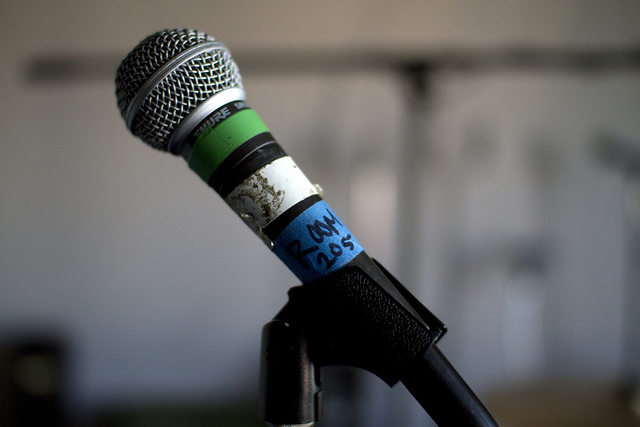 The invention of the microphone changed the way that speeches were given forever. Prior to their invention, the best speakers where the ones who had the best projection. When they spoke, the people in the back of the room had a chance of being able to hear what they were saying. Once microphones showed up, there was no longer a need to be so loud. Microphones allowed speakers to use more vocal subtlety – they could become more intimate with their audience and yet still get their message across to everyone. The arrival of television also had a big impact on how we give speeches. Prior to television, often times when we gave a speech it was just to the people who had managed to squeeze into the room where we were who got to hear it. However, television changed all of this. Now our speeches could be broadcast to people far and wide. Television also changed the type of speeches that we gave. Television cameras have the ability to zoom in and focus on our faces. This creates a very intimate “I’m just having a talk with you” type of environment. Speeches have been changed to reflect this new reality. The modern age that we live in allows us to take advantage of all of the technologies that have been invented so far. What this means for us is that if we’re not careful, we may end up starting to shape our speeches to work with the technology and not our audiences. The modern political use of “sound bites”, short phrases that get remembered after a speech, is an excellent example of this in action. Another good example is Twitter. Our audience has access to their mobile phones during our speech. If we happen to say something that catches their attention, then there is a good chance that they will “tweet” about it during our speech. This knowledge can cause us to try to identify 140 character or less (the maximum size of a tweet) phrases that we can include in our speech. Including pithy phrases in a speech is no big deal; however, if we fundamentally change the construction of our speech to include them then we’ve allowed tweeting to take over our speech. Another problem that we are all facing is the simple fact that with the advent of all of this technology we can now possibly become too good. What this means is that if we can record ourselves during practice and then watch and listen to our performance this allows us to control every small detail of how we give a speech. The end result of all of this is that we may end up being too polished. Our human edge, as demonstrated by flaws in our speech, may be covered up. If this happens there is a very good chance that our audience won’t be able to connect with us. There is no question that all of the new technology that has shown up over the past few years has been a boon for public speakers. Look, it’s hard enough to write, practice and then deliver a speech without having to worry about if our audience is going to be able to either hear or see us. However, as with all good things in this life, there are cautions that we need to be aware of. The arrival of the microphone was a boon to speakers. Now instead of just having to be the loudest person in the room, we could use our voice to do a better job of connecting with our audience to share with them the benefits of public speaking. Television came next and its use of the close up allowed us to better connect with the individual members of our audience. Finally, in our modern age we need to be careful to not write our speeches to match the technology of the day or polish our speeches too much so that they lose their human appeal. If there is one thing that we can count on, it’s change. The great technology that we have available to us today will only get better as we move into the future. As speakers it is our obligation to understand what technology we have available to us today and then to make the best use of it in our next speech. Let technology help you to reach out to your audience in order to both capture and hold on to their imagination. Question For You: Do you think that it is acceptable to work key phrases into a speech in the hopes that they’ll be remembered and repeated? In most of the speeches that we listen to today, we tend to hear the same things over and over again. There are the trendy words of the day, the clever business-speak that we all know but it seems like nobody really understands the importance of public speaking in order to create speeches that really work. The problem with these types of speeches is that they simply are not memorable. They go in one ear and out the other. What we need to do is to come up with a way to make our words more memorable. It turns out that there is an easy way to go about doing this: add some poetry to your next speech.